Now, I know we all want to be the gourmet cooks of our kitchen who slow roast a dinner every night in a special French dutch oven. OK, reality check. That is who we would love to be, but we actually are real people, who have jobs, school, family, workout sessions, errands to run and oh, by the way, want to sometimes get a full night’s sleep. And while accomplishing all of this we want to eat healthy, unprocessed food to fuel us for our busy life. So where do we find the balance between our dreams and reality? Right here, as a simple start, with the help of the Memorable Kitchen. 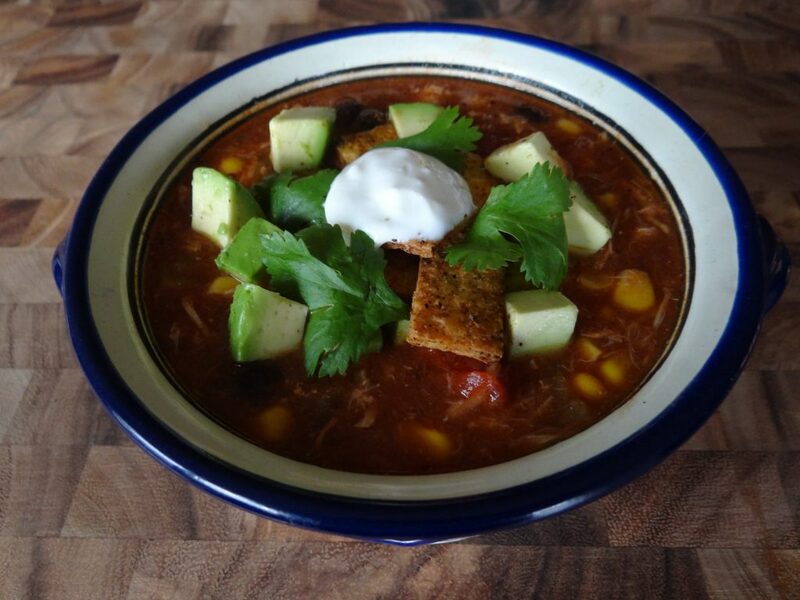 I am going to give you the best ever Easy Chicken Tortilla Soup recipe that will make your head spin. You will feel like that amazing chef that slaved all day in the kitchen, but in reality, you will be the time saving, efficient, super gourmet that you always wanted to be. 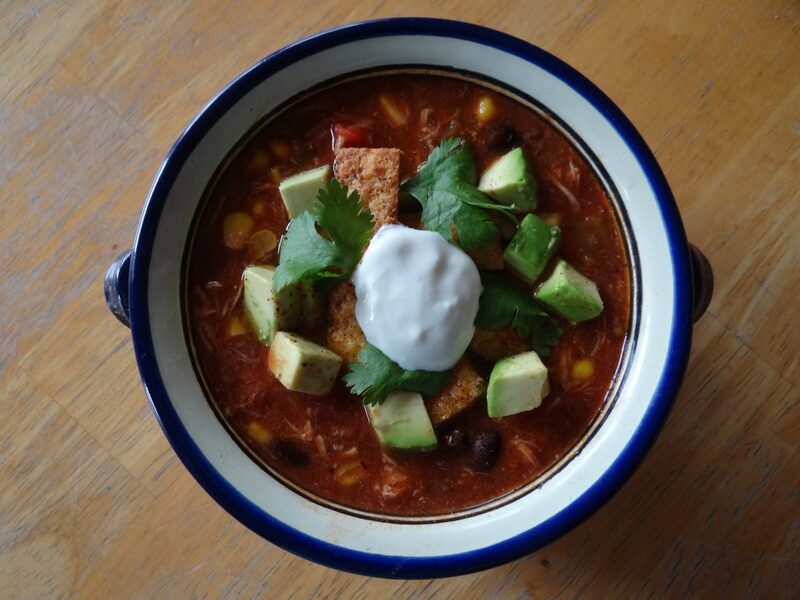 What makes this Easy Chicken Tortilla Soup recipe so incredible is the fact that it starts with an easy recipe for crock pot chicken as the base and then adds lots of yummy ingredients that are quick, healthy and will save you money. Then, oh then, you add the finishing touches, of crispy tortilla strips, luscious avocado, cool sour cream, yummy shredded cheese and fresh cilantro as the crowning glory to your already amazing dish. 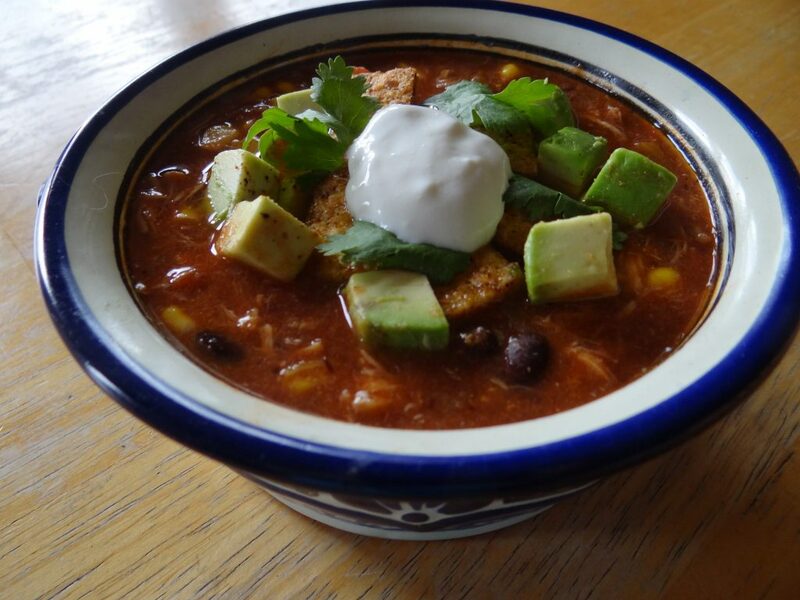 What could be more satisfying on a cold day than a rich, spicy bowl of Easy Chicken Tortilla Soup. You know, you deserve this. It is the New Year. You have made resolutions and you are sticking to them. So, this is your reward!!! Oops. Did I mention this is healthy too. Yeah!!! An even better reward. So enjoy, and wrap yourself in a warm bowl soup. An easy, healthy, flavorful and rich soup, to warm you from your head down to your tummy!!! Happy, warm, healthy New Year from the Memorable Kitchen! Place chicken and chicken stock in a large stock pot. Bring to a simmer over medium high heat. Cook for 2 minutes over slow simmer. Add in all other ingredients except corn and beans. Simmer for 5 more minutes. Add corn and beans. Simmer for 2 more minutes. Serve in bowls and garnish with Tortilla Strips, Avocado, Sour Cream, Cheddar Cheese and Cilantro. Preheat oven to 375 degrees. Spray a baking sheet with cooking spray. Slice corn tortillas into ¼ to ½ inch strips and place in a bowl. Drizzle with olive oil. In a small bowl or measuring cup, combine spices and salt and pepper. Mix to combine. Sprinkle over oil coated tortilla strips. Toss to coat. Place on prepared baking sheet. Bake for 10 minutes, turning after 5 minutes. Remove from oven. Set aside for soup garnish.